Junagadh or Junagarh city situated on the foot hills of Girnar hills in Gujarat used to be a Princely State before India’s independence. The name of the city translates to "Old Fort" while it was also known as "Sorath" earlier. 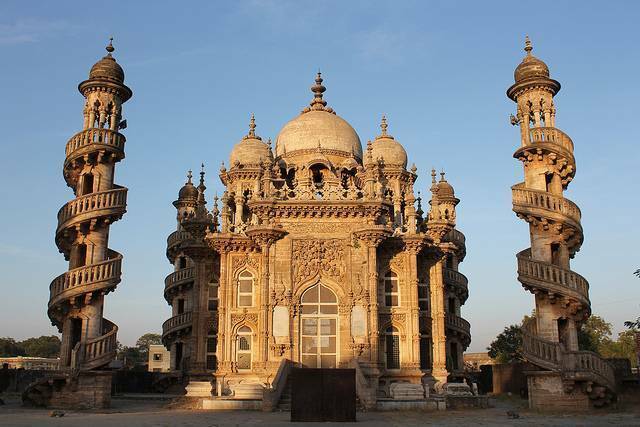 Junagadh, although not frequented by tourists has an incredible 2300 years of history attached to it. While visiting Junagadh one has to take a drive to Ginar Hill, a mountain covered with Jain and Hindu Temples that can be reached after a climb of 10,000 stone steps. The Jain temples are beautifully decorated by mosaic domes and a further climb will lead to the Hindu temples that are no less magnificent. The famous Somnath Temple, one of the 12 holy Jyothirlingas is just about 80 Kms from Junagadh. Mount Girnar is another popular Jain pilgrimage place near city. City has many monuments but the most famous of all is the 16th century Junagadh Fort. Gir National Park and Pania Wildlife Sanctuaries are two good places to spot wildlife in the region. The Bhavnath Mela, celebrated over a span of five days in the month of Magha is accompanied with a colorful display of folk music and dance. It marks the time when Shiva is believed to have danced his cosmic dance of destruction. The Uparkot fort, an ancient marvel built in 319 BC by the Mauryan emperor Chandragupta is surely un-miss-able while visiting Junagadh. A striking feature about the fort is the spiral staircases running along the well shaft that are without a doubt alluring to look at. Also, if one wants a glimpse at Euro-Indo-Islamic architecture then the lush appeal of Mahabat Maqbara is sure to do so. If striking displays of architecture and ancient history are something that sparks your interest then Junagadh is definitely the place to go. Best time to visit Junagadh is from October to April. Summers are hot here and winters little chilly.